The tunic is a piece of must-have maternity wear that makes getting through those nine months a little easier. Tunics provide plenty of space for that growing belly and are the perfect length to cover your hips and bottom. If you are sick and tired of the same old tank top and sweatshirts, spice things up with a tunic. Tunics are stylish and comfortable and will allow your belly to grow throughout your pregnancy. The best thing about a tunic is that you'll wear it throughout your pregnancy as well as after you give birth. A tunic is perfect for the day time if you have a lunch meeting or if you're going for a walk in the park. Wear your tunic over a pair of skinny jeans or leggings for maximum comfort. A stylish tunic is a great alternative to the t-shirt and leggings look. You can easily transform your look from day to night with a pair of heels. For the perfect nighttime look, wear a sheer black tunic with a black tank and black jeans; add boots or sandals for a super chic look. Tunics are also perfect for vacation; try a lightweight style with beading around the neck - perfect comfort and style for poolside lounging. 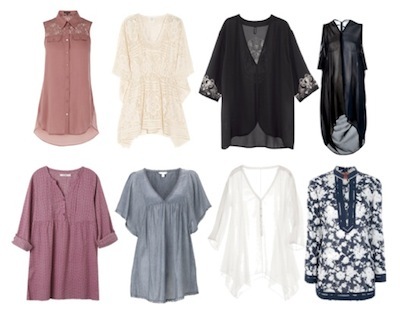 Tunics are dressier than your average shirt, but effortless and take minimal time to style. For those days that you just can't decide what to wear, just throw on a tunic. During your pregnancy it is important to feel fresh and pampered; it's important to take care of yourself and still find pleasure in getting dressed everyday. Step outside your comfort zone and into a new one that challenges you everyday. Start small- maybe that means putting on jeans instead of leggings one day. The small effort of throwing on a pretty pair of earrings or necklace can change the way you feel all day. Rethink getting dressed everyday, it's all about the attitude - enjoy it or hate it, it's up to you!